Honey, I ‘dunked’ the pork! And I entered a contest! a) There is a Home Cook Challenge going on right now with them where I could also enter to win a gift certificate to buy fun kitchen things! c) They are local, and I feel like are the granddaddy of the Calgary beer scene, they were making beers before I was even born! 1) In a medium bowl, add first six ingredients and stir to combine. 2) Chop meat into 10-12 large, evenly sized chunks and season generously with salt and pepper. 4) Cook on medium-high heat, turning to seal and lightly brown on all sides. 5) When pork is browned, add the Dunkelweizen mixture to the pot and bring to a boil. 6) Once boiling, put on the lid and reduce to medium to low heat*, pressure cooker should keep high pressure for 30 minutes, with the pressure control lightly wiggling consistently but not releasing too much steam. 7) Remove from heat and let rest for 10-15 minutes or until pressure has decreased enough to open. 8) Using two forks gently pull apart the meat. 9) Add more salt and pepper to your taste if you wish. Also, if mixture isn’t thick enough, you can simmer on low heat until the juices are reduced to your liking, I personally don’t mind, I just grab some napkins. 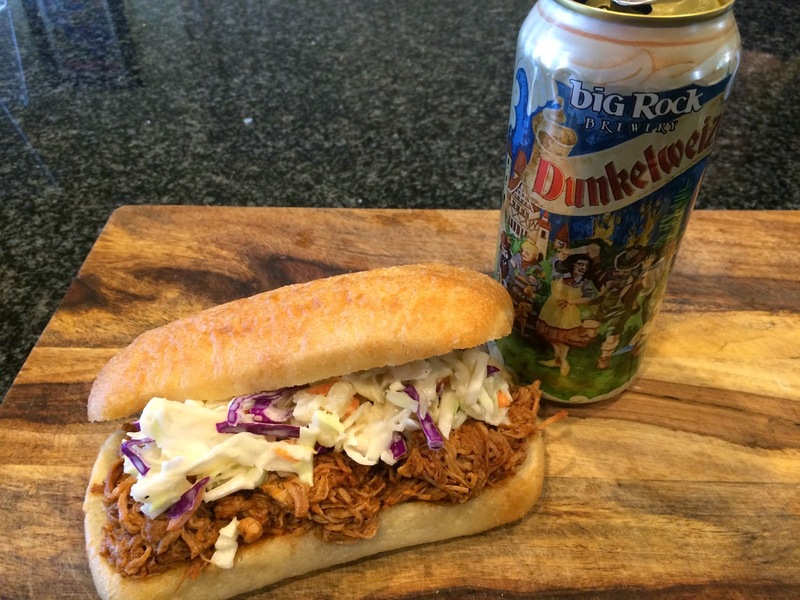 10) Serve on ciabatta buns with pineapple coleslaw – and crack another Big Rock Dunkelweizen to accompany your meal! *If you are not using a pressure cooker, you may transfer to a slow cooker at this point and cook on medium setting for 6-8 hours or until meat falls apart easily with a fork.